Why Indian Women Prefer Online Shopping For Anklets? 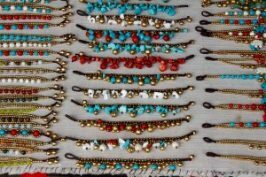 Home » Why Indian Women Prefer Online Shopping For Anklets? Shopping for anklets online? The inherent nature of women to look beautiful makes women adorn themselves with one or the other fine ornaments. On such ornament includes anklets. Everyone enjoys the subtle melody sound of the anklets and wearing them helps women or girls to re-vibrate the energy in their own self. Though the anklets don not symbolize much in the West, anklets are an essential piece of jewelry in the Indian marriages along with a saree. In the Indian Culture, Anklets serve as a considerable part of a woman’s adornment. It is believed that any negative energy flowing inside the house can easily be quashed away with the sound of the anklet you are wearing. Nowadays, a wide variety of anklets are available online to quench all your desires for your ornaments. When the family members will sit together, then hearing the sound of the anklet would enable to know that a woman is coming and would welcome her with respect. Anklets are considered to be traditional, and an auspicious gift for the new bride in India. Heavily carved anklets (payal) and anklets with exquisite designs are always the faves for the newly wedded couple. Moreover, the bride wears the anklets as a symbol to announce her presence in the house with the tinkling sound of the anklets. Usually, Hindu women in India wear anklets (payal) made of silver and not of gold. This is because Hindus consider Gold as their God. Hence, wearing Gold in the lowest part of the body is considered as an ill-omen and disrespectful. Unlikely, sometimes even the unmarried girls wear the anklets at times. They wear distinctive anklets with small bells on it, which makes it sound quite different. Well, it is a bright way to gain someone’s attention especially when you are seeing someone as your life partner. According to Hindu belief, our feet and hands constantly emit energy and a precious metal is believed to prevent the release of energy, and thus, anklets insulate the person from negative influences. Though the anklets have been also found in the culture of Egypt and Middle East, India lays emphasis on the use of the anklets to the point where they are being emulated all across the world. What is the wait for? Embellish yourself with the anklets online shopping right now!